FBJNA is firmly established as multimodal freight newspaper for North America. FBJNA reaches out to the decision makers and influencers involved in international freight transport and logistics. FBJNA boasts the most informative and authoritative source of information with unrivalled in depth knowledge of the rapidly changing freight business environment. Atlanta Daily World is a publication that is distributed locally. It covers local news, including community events, entertainment, sports, business, real estate and classifieds. 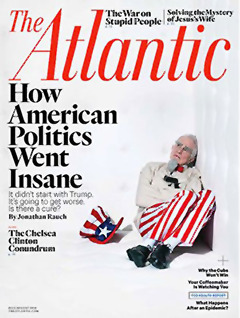 For the first time in the modern history of The Atlantic, the magazine is sending the current issue back on press for an unprecedented second printing to meet newsstand demand. Publishers looking to increase traffic from search engines, specifically Google, should be very happy. SimilarWeb released numbers related to the top 20 media sites that saw an increase in site visits from organic search traffic in June. For some, it looks pretty darn good. The data leapfrogs off a study released earlier this month from SimilarWeb that reveals how Facebook threatens to take news site traffic from publisher sites, while Google provides an increase of organic search traffic to publisher sites. The suntimes.com saw the highest increase in organic search traffic between May and June, with an increase of 307% for organic search. Rounding out the top five, lifedaily.com followed with 265%; miamiherald.com, 242%; nationalinterest.org, 234%; and orlandosentinel.com with 215%. If the data is broken down into categories such as Media and News or Finance, it tells a different story. Finance led all categories with 16% growth, the Media and News category followed with 14%, and Games rose 13%. Some categories experienced a drop in their organic search traffic, with Career and Education sites seeing a 25% decrease in organic search between May and June 2016. The How To / Ask an Expert category dropped off 20%, and Books and Literature fell 13% in organic search traffic on a month-to-month basis. Apparently it's all in the algorithms. Roy Hinkis, head of SEO and digital marketing evangelist at SimilarWeb, attributes the shift partly to the release of Google's quality "Phantom" update in June, although Google has not confirmed. As for the growth rate in June 2016 compared to May 2016, for the remaining 15 domain names: nypost.com, 156%; pjmedia.com, 153%; upi.com, 146%; ibtimes,co,uk, 136%; freep.com, 126%; observer.com, 125%; nesn.com, 114%; esquire.com, 107%; thinkprogress.org, 105%; nbcsports.com, 104%; theweek.com, 97%; vox.com, 96%; cbssports.com, 72%; dallasnews.com, 70%; and businessinsider.com, 66%. Renewals made via opens/downloads must be tracked with unique authentication codes and must contain a date and timestamp for each open/download. Clients must be able to provide click logs and other necessary data to auditors to verify engagement rates within the audit period. Please note that demographic data will not be considered renewed in this process. If you have questions regarding non-paid direct request digital edition requalification, please call Verified at 415-461-6006.